I recently had trouble with Easy CD creator 5 Basic, as it wouldn't burn CDs. This apparently is caused by one of Microsoft Windows update (I just can't recall which one). I removed the application from the ADD/Remove software from the control panel, and re-installed it. I then went on to Roxio's web site and updated Easy CD Creator to version 5.3.5.10. The problem I am now experiencing is the computer is very slow. From the task manager, I was able to locate an issue with DirectCD.exe. It is using upwards of 90% of CPU cycles (see attached screen capture). 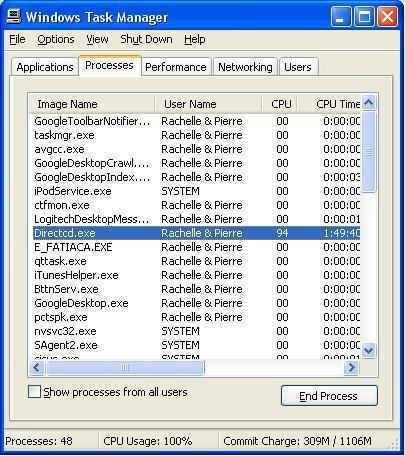 If I kill the application from the task manager, everything becomes normal again. What can I do to fix this problem, as this application will re-load on the next start-up? go to start, then run and type in "msconfig" without the quotes. When msconfig launches click on the last tab to the right. Look for direct cd and deslect the check box next to it. exit program and reboot as prompted.